Definition at line 41 of file lldrawpoolalpha.h. Definition at line 44 of file lldrawpoolalpha.h. Definition at line 56 of file lldrawpoolalpha.cpp. Definition at line 67 of file lldrawpoolalpha.cpp. Definition at line 77 of file lldrawpoolalpha.cpp. Definition at line 51 of file lldrawpoolalpha.h. Definition at line 72 of file lldrawpoolalpha.cpp. Definition at line 124 of file lldrawpoolalpha.cpp. References LLPipeline::enableLightsDynamic(), LLPipeline::enableLightsFullbright(), f, getVertexDataMask(), glColor4f, gPipeline, LLVertexBuffer::MAP_TEXCOORD, LLVertexBuffer::MAP_VERTEX, renderAlpha(), renderAlphaHighlight(), sShowDebugAlpha, and LLViewerImage::sSmokeImagep. Definition at line 115 of file lldrawpoolalpha.cpp. References LLFastTimer::FTM_RENDER_ALPHA, gPipeline, LLPipeline::mAlphaGroups, setup_clip_plane(), t, and TRUE. Definition at line 145 of file lldrawpoolalpha.cpp. References LLGLState::checkClientArrays(), depth, LLDrawable::getRenderMatrix(), glMultMatrixf, glPopMatrix, i, LLSpatialBridge::mDrawable, LLMatrix4::mMatrix, NULL, LLRenderPass::PASS_ALPHA, renderGroupAlpha(), and TRUE. Definition at line 191 of file lldrawpoolalpha.cpp. References LLDrawPool::addIndicesDrawn(), LLGLState::checkClientArrays(), LLDrawable::getRenderMatrix(), glDrawRangeElements, glMultMatrixf, glPopMatrix, i, LLSpatialBridge::mDrawable, LLMatrix4::mMatrix, NULL, params, and LLRenderPass::PASS_ALPHA. Definition at line 247 of file lldrawpoolalpha.cpp. 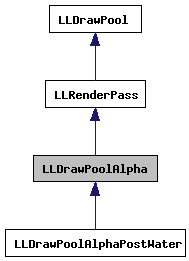 References LLDrawPool::addIndicesDrawn(), LLPipeline::enableLightsDynamic(), LLPipeline::enableLightsFullbright(), f, FALSE, glDrawRangeElements, glGetBooleanv, glLoadMatrixf, gPipeline, LLSpatialPartition::mDrawableType, LLSpatialGroup::mDrawMap, LLSpatialGroup::mSpatialPartition, params, LLPipeline::RENDER_TYPE_CLOUDS, LLPipeline::sRenderGlow, and TRUE. Definition at line 65 of file lldrawpoolalpha.h. Referenced by LLViewCheckHighlightTransparent::handleEvent(), LLViewHighlightTransparent::handleEvent(), LLViewerWindow::hitObjectOrLandGlobalAsync(), and render().